BC has a high rate of foreign ownership. Why? Wealthy people in unstable regimes want to buy here; we have a history of 'selling passports or residency' to wealthy families; and our current tax system subsidizes foreign ownership. The tax called the Speculation and Vacancy Tax (SVT) is aimed at limiting speculation, not necessarily taxing “speculators”. Read this article for more information The Speculation and Vacancy Tax: An Explainer Josh Gordon School of Public Policy, Simon Fraser University March 4, 2019. A few points from the article are noted here. CRA allows a wealthy person to access all of the social services and public amenities as the high-earning local individual, but not pay income taxes. They can file as a non-tax resident, even if their family resides here. This is the so called “satellite family” situation. Gordon, in his article, states that we can address this issue in the tax system by imposing a property surtax on families who have most of their income earned abroad. The speculation component of the SVT seeks to address a tax avoidance problem. However, there are many exemptions and foreign owners and satellite families are able to avoid a speculation tax liability if they rent out their properties to an arms-length tenant, in whole or in part. The SVT aims to encourage unused housing units into the rental market with vacancy taxes. For many, housing sitting empty, especially as speculative investments, in the midst of a housing crisis is unacceptable. So, “Why don’t we just ban foreign ownership already?” Some have urged banning foreign ownership as an alternative to the SVT. With the foreign buyer tax, currently at 20%, purchases by foreign buyers are already down substantially at only 2-3 percent of total purchases last year in affected areas. The housing crisis is not an easy problem to solve. Learn more by reading this article about the SVT - Speculation and Vacancy Tax and it's intent and aims. Tell us what you think. Inequality is one of the big issues of our time, and it will not be reversed by philanthropy. That was one frank assessment by a Dutch historian who recently took part in a Davos panel. Yes, at the international conference for the wealthy elite convened in Switzerland annually. Rutger Bregman called out the bankers, politicians and tech billionaires for being all talk and only serving themselves. His remarks became a social media sensation. 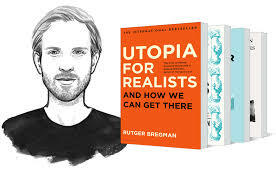 Bregman's recent book is Utopia for Realists and it appears to touch a nerve with some - perhaps a Utopia for others. We have a system that rewards the wealthy with praise and status if the 'give back'. But this is a sham, or even a scam. No matter what wonderful things a few very wealthy people may support, the system is simply designed to make them all richer. Another book, Winners Take All, by Anand Giridharadas, has received great reviews because the book clearly describes the corrupt model; the shortcomings of celebrity billionaires, their foundations, and their vanity. It will take more than a few outspoken voices to re-balance the tax burdens in Canada and elsewhere. This is an issue with many faces. Recent changes to property taxes in BC are step in the right direction. Higher marginal income taxes for the rich and fewer tax exemptions are needed. We need to support measures that will maker our tax system fairer. And we have to challenge the myth that the charity of the super-rich is some kind of answer. Today the CCPA published a great blog post on the land wealth inequality. Using publicly available data from Stats Canada and the Canadian Revenue Authority, Alex Hemingway documents how the rich get richer. This is a BC based analysis of how the boom times have enriched the top 20%, or the top 5% even more. The concentration of wealth in relatively few hands is difficult to swallow in an allegedly 'democratic', egalitarian country. The top 20% by net worth own 62% by value of all the real estate designated principal residences; and 80% of all the other real estate (presumably rental, commercial, and industrial). On the flip side, the 60% with lowest incomes own only own only 13% of the value in principle residences. The post notes that this inequality is the result of tax treatment, and Hemingway endorses the new speculation tax and new school tax that will require higher value landowners to pay more. He suggests implementation of a progressive property tax. Yes, these are good measures, but we should also place a cap on the capital gains tax exemption for principal residences. The existing tax regime benefits the wealthy because they pay attention and lobby. Ordinary people have to push for a fairer system. It is possible to get this tax question on the table for the next Federal election. It did come up last year. This item from policynote.ca is a call to action for those of us who want to challenge the status quo. The Provincial government has done the right things so far, but there is more to do.